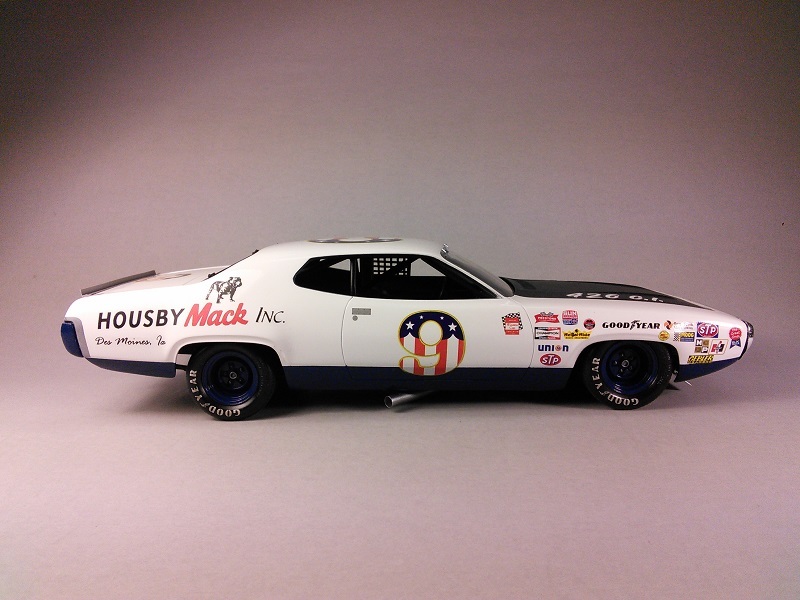 Pete's '71 Plymouth from the 1973 Daytona 500. 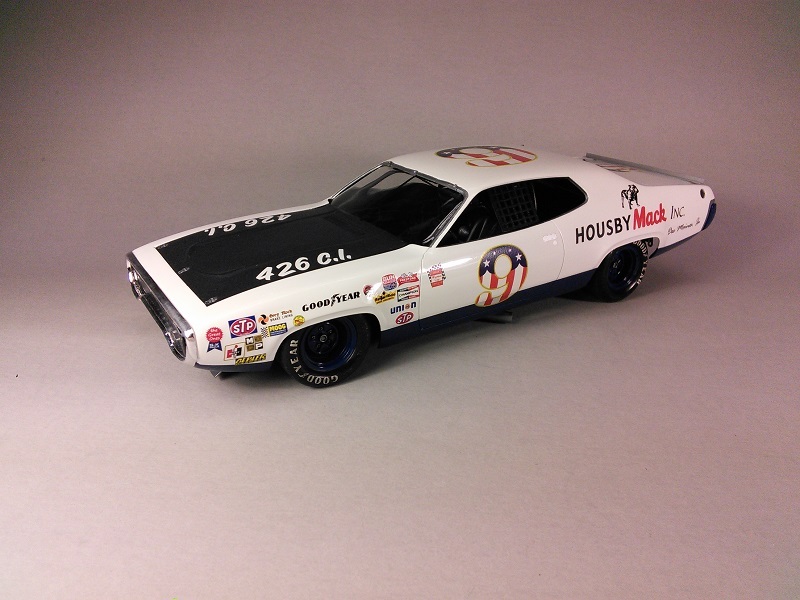 KIT: Monogram 1/24 scale '71 Plymouth GTX street car modified for nascar. Chassis and cage from the MPC re-issue of the Pepsi Laguna. 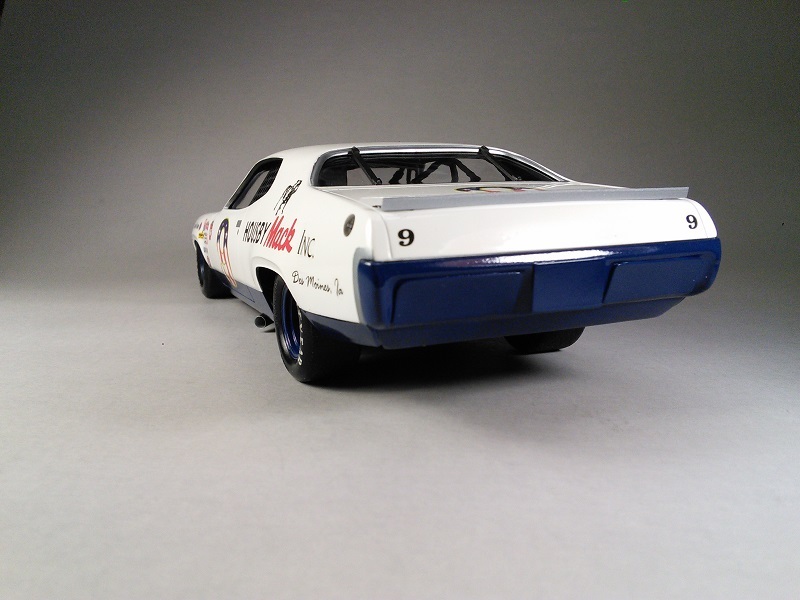 PAINT: Tamiya TS-26 Pure White and TS-15 Blue. 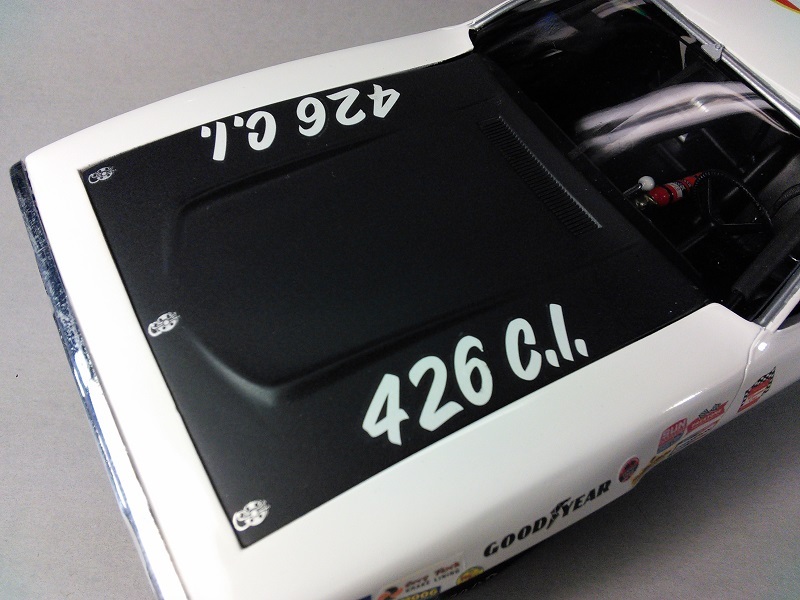 Chassis painted black using Tamiya XF-1 Flat Black then clear coated using Testor's Acryl Semi-Gloss Clear. DECALS: Lobographix. Excellent decals and even better people to deal with! Used spares box (mainly Powerslide) for the contingencies. I used a Prestone and SUN instruments for the contingency next to the Winston Cup logo since I could not figure out what the real contingency was in that location. Close enough for me. I can always replace those if I ever figure out what it was. WHEELS/TIRES: PPP. Simply the best! 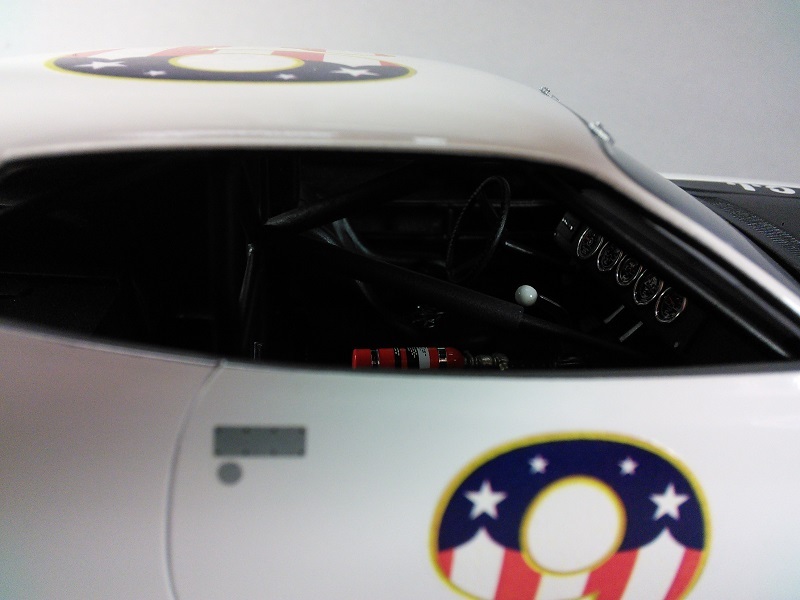 BUILD NOTES: Since I was using the 1/25 scale MPC chassis and the Monogram body was 1/24 scale, I carefully measured the body wheelbase and matched the chassis to fit. I had just enough of the 2-piece chassis to barely overlap and glue. I reinforced the joint using Evergreen plastic. 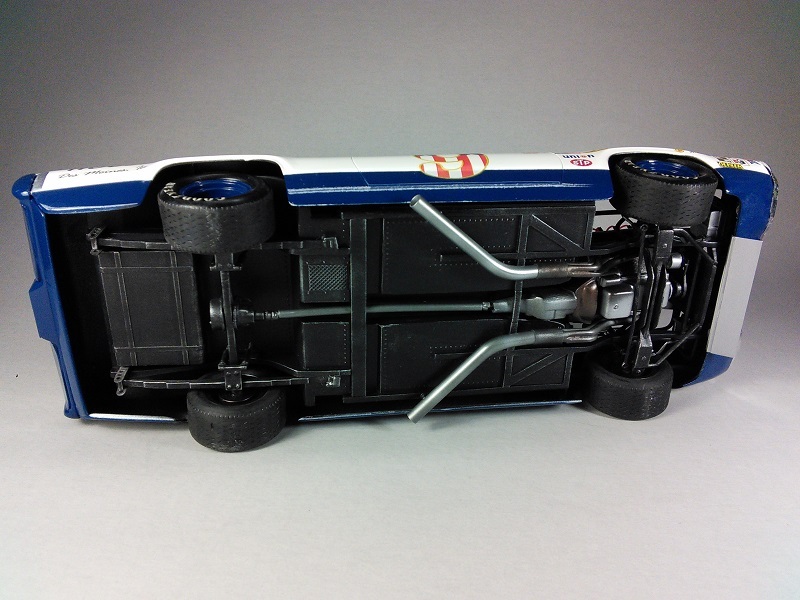 I used the MPC blue-colored roll cage and only had to fabricate the A-Post bars using Evergreen 1/16" rod. Of course I had to cut out the hood center section with the air grabber and replaced with Evergreen sheet then filled in. I made my own dash and instrument gauge using Evergreen plastic. The extinguisher came from the spares. I did have to extend the MPC drive shaft which I did using 1/8" Evergreen tubing. I measured then cut off the kit universal joints and attached them to the Evergreen tube. 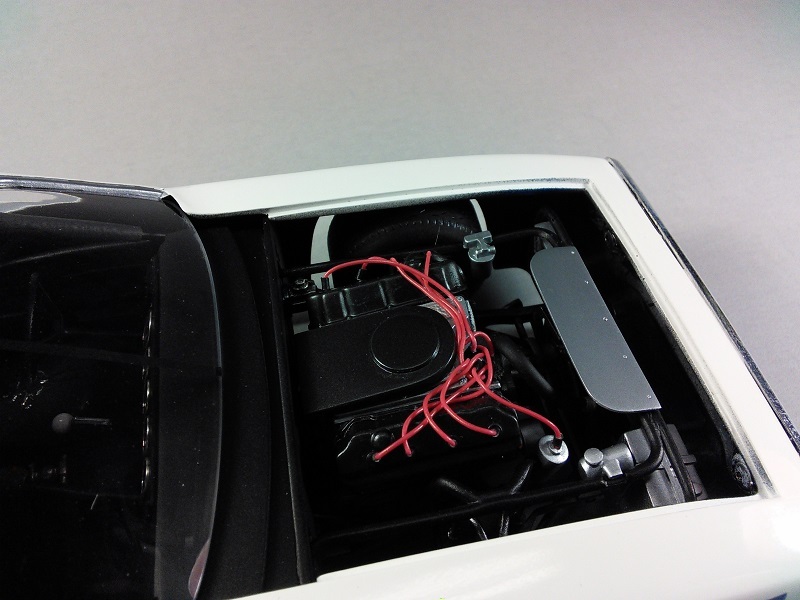 I also could not use the carb and air breather together because of clearance problems with the hood. I simply left off the carb and glued the air breather straight to the intake. It is a simple shelf model so I didn't worry about it too much. 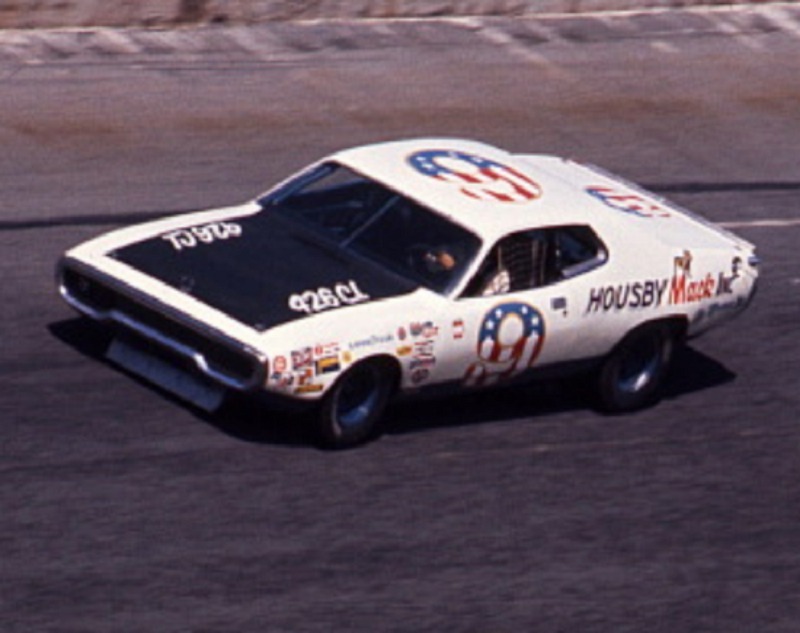 I always liked this car, especially the stars and bars numbers. 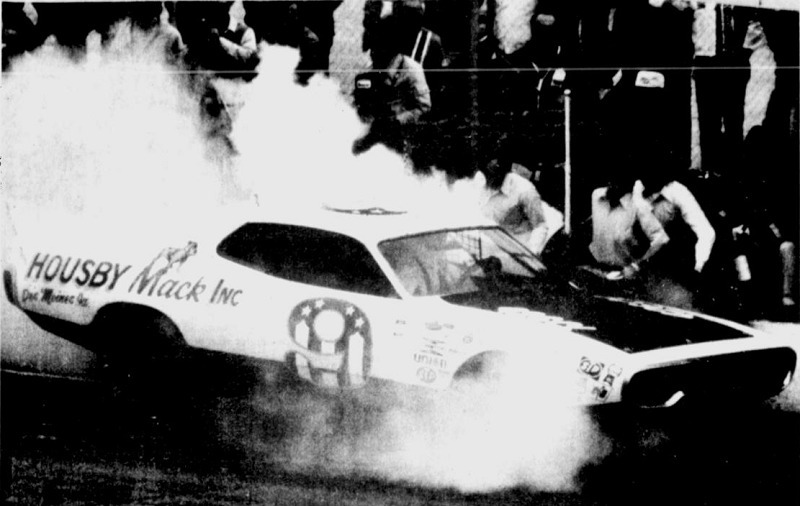 BTW, Pete qualified on the outside pole for the '73 Daytona 500 and was running well until the engine let go on lap 33. 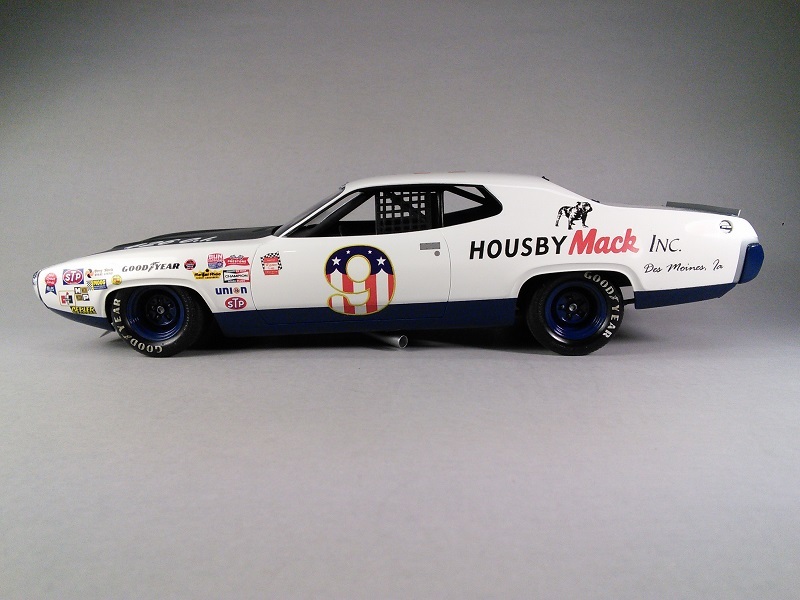 The model makes another great addition to my Early-'70s collection. Another killer Bobby!!!! And a neat subject also. Wow, very nice build and interesting subject. Another excellent build, nice choice of subject as well. My hat is off to you!!! A real thing of beauty Bobby. Love the stance, that thing looks mean. Awsome job. Outstanding Bobby. Top drawer work! This is a great looking build , you do real nice work . 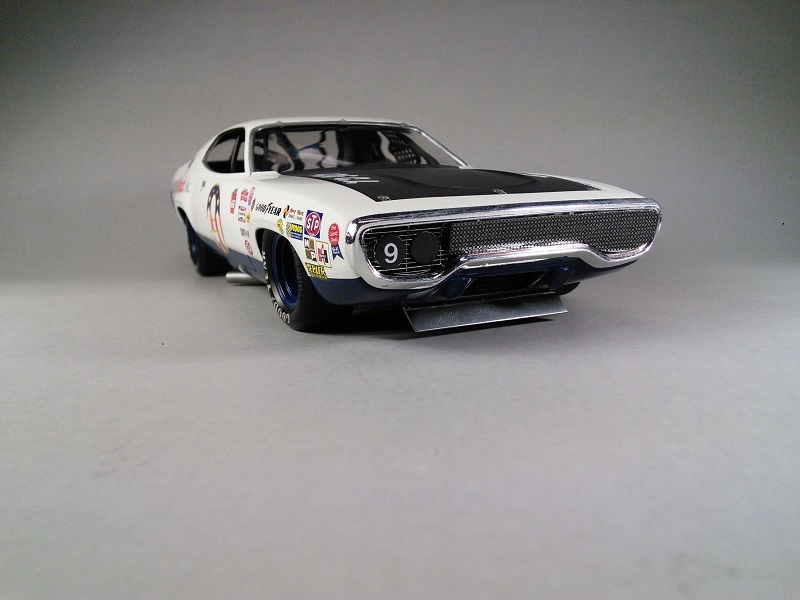 Great looking build Bobby, what'd you use for the grille & exhaust pipes? Thanks for the compliment pulln4dejr. I made the grill screen using a Slixx Screen decal over a piece of Evergreen sheet plastic. I carefully cut out the plastic sheet to fit, painted it with Testor's Metalizer Gun Metal, then decaled with the Slixx Screen decal cut to fit. The headlight covers are simple Evergreen sheet punched out with a common paper punch. Then painted with Testor's metalizer Exhaust. 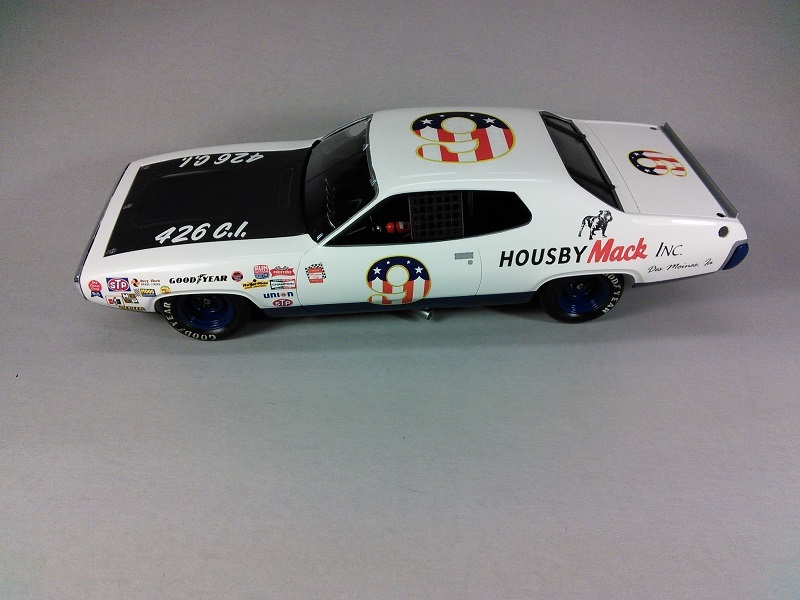 The #9 decal came from a Microscale white letter/number sheet. Hope this helps. Gosh Dang I Love IT!!!!! great build bobby. ihaven't had the inspiration to build lately but i would like to convert the street rr to a stocker. like i said great build but something doesn't look right. the kit looks very long. 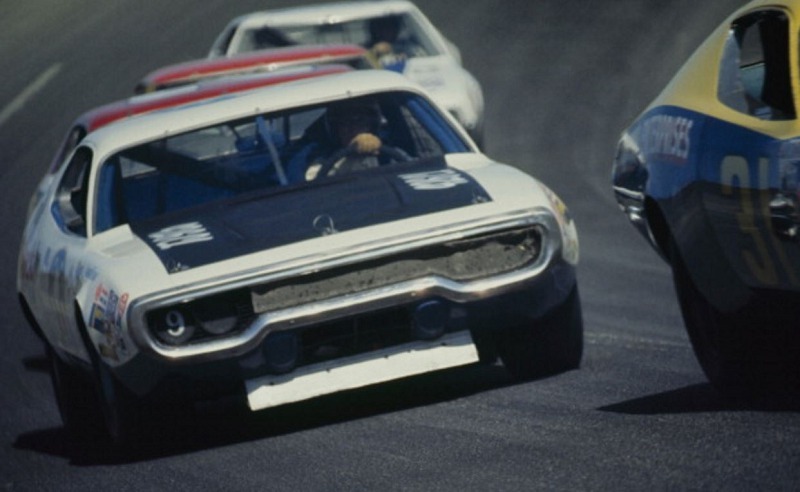 was the street body longer than what was raced? or am i seeing things?